Talkative, melodramatic western with a small cast. 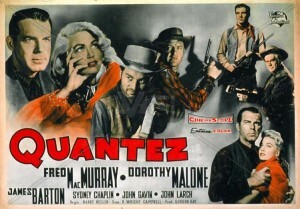 This is one of Fred MacMurray’s better westerns, and worth watching. 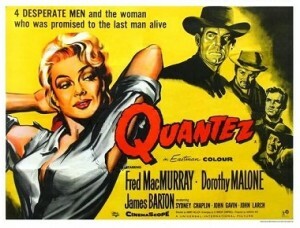 The title refers to a ghost town in which a small gang of outlaws finds itself after a robbery. The band of outlaws is retreating across the desert toward Mexico, on the run from a posse after robbing a bank. They haven’t been together long, just put together by the ruthless Heller (John Larch) for this job. 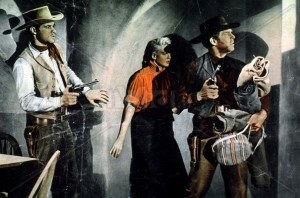 They include Chaney (Dorothy Malone), Heller’s woman; Gentry (Fred McMurray), an experienced desert scout; Gato (Sydney Chaplin), a white man raised by Apaches; and Teach (John Gavin), a young easterner good with a gun. After eluding the posse in Apache country, they come to Quantez one horse short, only to find it abandoned. The action and a lot of dialogue take place over one night as they try to sort out their differing loyalties and objectives. Heller, as it turns out, is willing to leave Chaney behind. Gentry keeps trying to make things work, getting both Heller and Teach to back off in turn. As matters develop, both Teach and Gentry seem to be interested in Chaney, setting up another potential conflict. 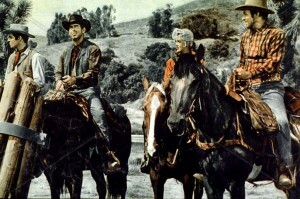 Itinerant artist Puritan (a contrived-seeming name, played by James Barton) rides into the ghost town, singing about a gunfighter named John Coventry and painting Chaney’s portrait. Gentry, it is revealed, is Coventry, and he helps Puritan escape Heller’s clutches. Gato is trying to work out a deal with the Apaches led by Delgadito (Michael Ansara). In the end, they kill him instead. Gentry/Coventry is finally forced to kill Heller and holds off Delgadito’s band long enough to give Teach and Chaney a chance to escape. This is reminiscent of Yellow Sky, Rawhide, Man of the West and Incident at Tomahawk Gap, which all involve relative innocents captured by ruthless, unprincipled outlaws in remote locations in a movie with a noir-ish feel. It might be Fred MacMurray’s best western; he and Dorothy Malone are particularly good. In color, and short at just over 80 minutes. This can be hard to find, but it’s worth seeking out. 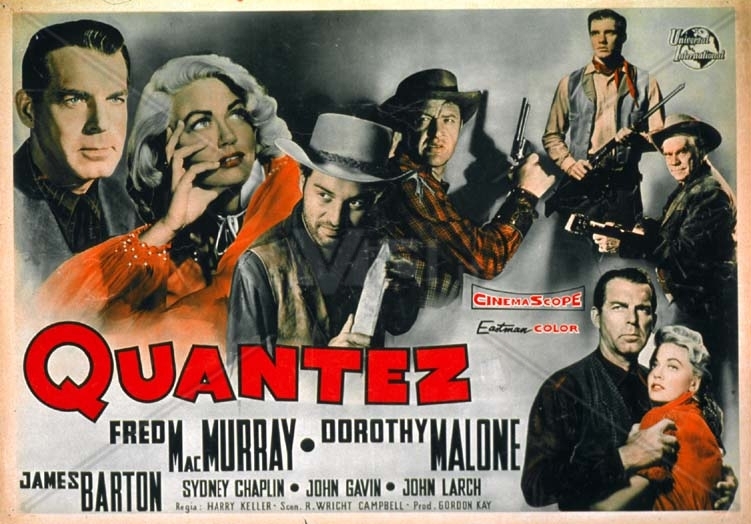 This entry was posted in Westerns Worth Watching and tagged Dorothy Malone, Fred MacMurray, Native Americans (Indians), Outlaw Gangs, Westerns Noir on February 8, 2014 by Nicholas Chennault.